The Greatest Showman to be screened at Grace Dieu! 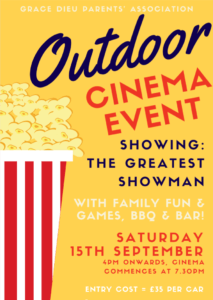 Grace Dieu is hosting its first Outdoor Cinema event – showing The Greatest Showman in its great grounds! The event, organised by Grace Dieu Parents’ Association (GDPA), is taking place on Saturday 15th September. As well as the cinema commencing at 7.30pm, the School will be alive with a variety of family fun and entertainment from 4pm – including bouncy castles, slides, and games such as ‘hook a duck’. There will be some delicious food in the shape of a BBQ, along with a fully stocked bar! The Outdoor Cinema event is open to everyone – parents, local families and fans of musicals! Tickets for car parking can be bought in advance (which includes entrance to watch the screening) for £35 per car. Unlimited rides on the bouncy castles and slides can be bought on the day for £5 per child. A variety of food and drink will also be available to purchase – including the all-important popcorn!